i had a leftover sheet of osb from the record table project that was an ideal size for a small project. i decided to create something for storing my shoes that were at the time lining the hallway, scuffing up the walls and looking quite sad. i only ever use a handful of shoes on a regular basis with the rest boxed up safely elsewhere. i wanted to see how a storage box for a “work pair/play pair” could be used. it had to be a meaningful solution to protect, display and ultimately care for your most-used, day-to-day shoes. you can get a bit obsessed with buying shoes and current storage products seem to feed off this. those clever mechanisms and racks are designed to be filled so you end up buying more pairs to close any gaps. more shoes means more mess. it’s a clumsy way of doing things and these products do very little to even protect your footwear. the box i wanted to create would be a simple housing for a few pairs only – work and play. it also had to handle a few shoe trees and sprays. i developed some sketches and settled on a stilted box concept (above). you could have one pair hidden away behind doors and a second sitting on top. there was a bit of adjusting to make it as simple as possible from an aesthetic viewpoint as well as making it easy to construct. 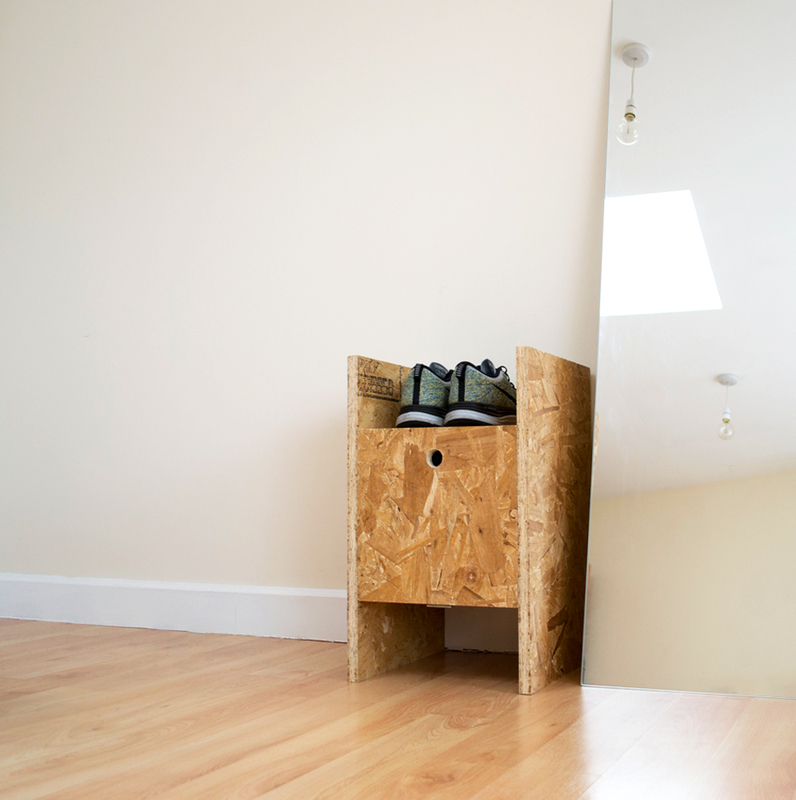 the finished freestanding shoe box. it sits neatly in a hallway or bedroom and acts as a nice discreet piece for your daily routine. osb makes the whole thing sturdy as well as giving the piece a rough finish suitable for day-to-day use. 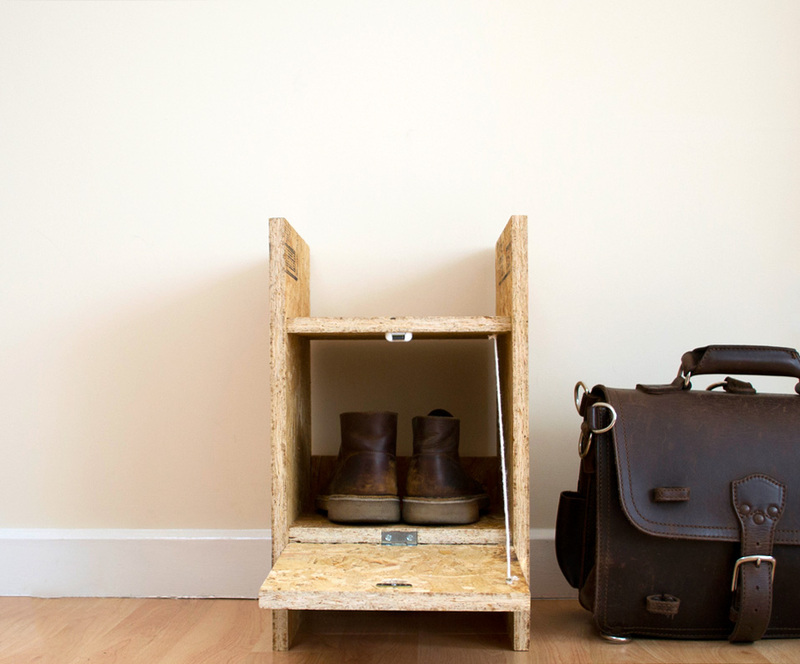 the top is only a temporary storage ledge when you’re moving shoes in and out of the box. you can leave it empty or use it to display your trainers. these are my nike flyknit lunar 1+. this multi-colour version is an amazing pair to put on show. the drop-down door is held with a shoelace tied around a few screws. a small magnetic catch is used to click it back into place. its quite satisfying to use and certainly feels better than hopelessly rummaging around under the stairs. overall this was a nice, cheap experiment. its a versatile piece and i might work on a modular version in the future.